The embroidery on the Bits of Bullion Bubble is almost complete (more on that later) so it's time to sew the pieces together. Here I've sewn the piping to the fabric around one of the armscyes, and have it pinned to the bodice lining to sew them together. To get the piping nice and tight, the bodice and lining need to be sewn together just next to the sewing line for the piping. With this light mint pique and white thread, it's almost impossible to see the where the needle goes in relation to the thread. After struggling with it for a while, I finally hit upon the idea of marking the thread so I could see it better. Sometimes a little tip like that can make all the difference in the world. I was able to see the piping seam well enough to sew the bodice and lining together. The bodice, with the piping relatively tight in the seams. This pattern has an overlapping side detail, with a little worm and snail almost peeking out from the overlap. Here's the bit about the embroidery not being quite done. After sewing the bottom pieces together, I realize that each side needs another little flower or something right in the lower centers. Luckily, I haven't put the floss and needles away and hope to embroider these last items later today. Here we are almost at the end of July, so I'd better get cracking to finish this by the end of the month. If only work didn't get in the way. If you would like to see my progress on this garment, just click here. I'm off to the International Quilt Festival in Long Beach, California today to see some gorgeous quilts and to shop a bit at the market. I hope all of you have a great Sunday and can manage to get some stitching in! Another finish! Don't you just love when that happens? This is the second one this month; I must be on a roll! Here is the Garnet Purse, all finished and ready to be carried about. I decided a bit of sunshine wouldn't hurt it, so I took this photo on the ladder in our front courtyard. It's an old ladder painted blue and filled with pots of succulents. I got the idea from a Sunset book and thought it would be perfect for our courtyard, especially as we had this old rickety wooden ladder. With a coat of outdoor blue paint, it makes a stylish plant holder. The purse has a gathered pocket for sunglasses on one side, and I added a split pocket on the back, for cell phone, keys, etc. You won't believe this next part. I discovered a silk shift in my closet the same dark red as the embroidery, bought several years ago and never worn. I'm visiting Mom tomorrow, so this will be perfect! Now if I could find something else to finish by the end of the month, that would make three finishes - I don't think I've ever had that many in one month. I did it! I completed the embroidery on the Garnet Purse while traveling home from Colorado right after the Fourth. One of the things that I really lika about this pattern is the unusual (for me anyway) stitches. This flower is made using two concentric rings of chain stitches, then a detached blanket stitch worked through the center of the inside ring and under both sides of the outside ring. I'll bet you couldn't tell that from looking at it! The petals are made with one of my favorite stitches, the fly stitch, but this time with a twist. Then the outer petals are made with a normal, untwisted fly stitch. Looks good, doesn't it? The small petals are heart shapes made using plain chain stitch, going from the center to the point of the heart on each side. The center is then a whipped spider's web with bullions around it. Sorry, no closeup of that one. The leaves on the large flower stems are a bit unusual, in that they are made with blanket stitch, angling the anchor stitch so the stitches curve to form the leaves. I didn't think I would like this, but after making a few, I decided they were pretty simple and effective. What do you think? I did make a change on the long stems. The pattern called for a twisted chain stitch, making sure to twist one side of the pattern opposite from the other. After I did several stitches on the right, I found that I wasn't twisting properly. As I was getting a bit low on thread and didn't want to risk taking any thread out, I decided to stitch chain stitches and fill them in later with a backstitch. Hmmm, that approach probably used quite a bit more thread than I would have used if I had taken out the untwisted chain stitches. Notice the shadows? This photo was taken in my daughter's back yard, where I was stitching and watching my darling little granddaughter. And here is the final embroidery. The large flower center was made with a row of chain stitches, then filled with french knots. The original called for Ghiordes knots, but I didn't want that much dimension, so I stuck with tried and true french knots. Not very original, I know, but I like it. Now on to construction. This is a fairly standard purse pattern which I won't modify other than to add an extra pocket or two to the inside. This is the lining fabric, The Adelaide Collection by Michelle Hill for In the Beginning Fabrics. It complements the garnet floss beautifully, doesn't it? Or maybe it's the other way around. I hope to have it finished and ready to show all of you by the end of the week. If you would like to see all the posts relating to the Garnet Purse, just click here. Happy Stitching! The latest issue of Sew Beautiful showed up several of weeks ago, with this adorable dress by Claire Meldrum. It is a bishop that doesn't use a pattern. Instead, Claire gives detailed instructions on how to cut out and mark the dress. The smocking is honeycomb smocking, a variation on North American Smocking. I'm using this fabric I had in my stash, a Debbie Mumm for Joann. I'll be smocking it with a light green floss, DMC 772. 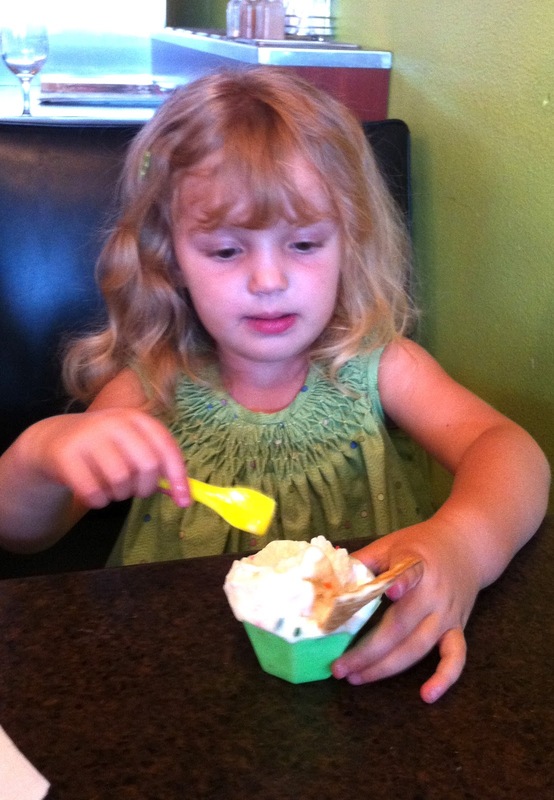 Now, how many of you read Mary Corbet's post on DMC from June 27? (along with all the comments, mine included). It was very interesting, do read it if you get a chance. It goes a bit into the controversy about a perceived decline in quality of their floss. By the way, this particular color I'm using is not marked as colorfast. But then the fabric probably isn't very colorfast either. smocked in the car on our way to visit our granddaughter in Colorado intending to construct the dress after I arrived. When I make any kind of project from a magazine, I copy the article to bring it with me in my sewing bag so I don't destroy the original magazine. Imagine my chagrin when I started to make the dress and found I didn't copy the complete article, just the smocking instructions. I had to drive to Jo-Ann Fabrics and buy a new copy of the magazine to get the construction part of the article. It was pretty darn easy to put together, and here is the finished product modeled by my granddaughter while inspecting her mom's vegetable garden. This was a very easy pattern, and I love the honeycomb smocking as an alternative to traditional English Smocking. It was very quick to smock, and only took 2-3 hours to construct. Most of that time was spent driving to get the magazine and hemming the bias strips and hem by hand. I did not, however, like the fabric. As I mentioned before, it is Debbie Mumm for Jo-Ann. I've bought Debbie Mumm fabrics from quilt stores before, and they are completely different. This particular fabric ravels very easily and is prone to developing holes if you have to redo a stitch. The fabric seems weak and doesn't have the nice feel that good quilt store fabrics have. Needless to say, I won't use it again. One thing I thought odd was Claire's instructions to make the neck front of the dress lower than the back by cutting the center front by 1 inch and tapering to the shoulders. It does look nice, but we don't generally do this on English Smocked bishops and we tend to be happy with the way they look. The reason I don't like it is that I feel it spoils the look of the smocking, as shown in the camera phone picture of Bridget eating ice cream. I also didn't arrange the pleats as well as I should have, which doesn't help. I'd like to make this again, using a cotton voile for a nice nightgown, leaving the neckline as is and arranging the pleats more evenly. We've been back from Colorado almost a week now, and I do have more things to show you, so stay tuned in the coming week! Happy weekend and I hope you can get some stitching done! Here in the US today is the Fourth of July, a time for fireworks, a reading of the Declaration of Independence, a barbecue and general relaxing! 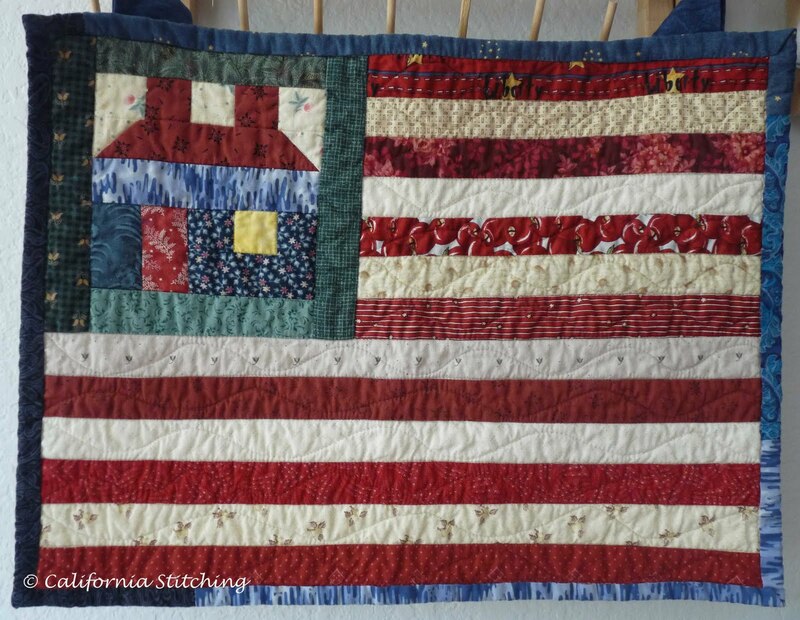 I thought I would show you some patriotic themed quilts, first up is this little quilt I made several years ago and have hanging in my upstairs hallway. I brought it into the sewing room for the photography, as you can see it here hanging from the thread rack. I believe I got this pattern from a TV show. As you can see, it's pretty darn simple, and would be very easy to duplicate without a pattern. I still have a small plastic bin filled with all of the strips I cut for this, there must be enough in there for at least two more. Since I made this I have purchased several yards and fat quarters of more patriotic fabric, so I have quite a stash! You could certainly make several and use as placemats for a patriotic themed table. The strips are cut 1 1/2 inches wide so they finish at 1 inch wide, using the standard piecing seam of 1/4 inch. The quilt is about 16 1/2 inches wide to give it the correct proportions, and the house finishes at 6 inches square. I used scraps of blue for the binding and hanging loops. The house by itself would make a nice potholder, if you're into such things. I generally buy mine at a kitchen store, as I like the ones with silicone strips on them. Now this is a quilt I made over ten years ago, and has been on my son's bed while he was waiting for the Black and White Log Cabin quilt to be finished. Now that I have it back again, I can show it to you. This was a mystery quilt that a local quilt shop was running. I picked out the fabrics, but am afraid that the flowered fabric doesn't have enough contrast for the friendship stars to show up well against the beige fabric. The very sad part about this quilt is that I had finished the main part of the top and was working on the borders when the terrorists flew the planes into the Twin Towers and the Pentagon. As I was working on a government installation at the time, we were all sent home around 9:30 am Pacific Time. So I worked on designing the borders, all the while glued to the TV watching the horrors unfold. What a terrible day that was. 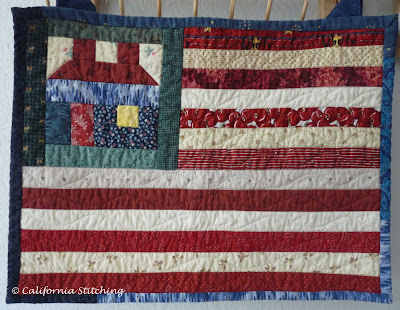 It gave me a tiny bit of cheer to be working on a red, white and blue quilt at the time, especially as the flowered fabric has a patriotic theme, with an American eagle on it. I even made a star pillow out of the extra blocks. I always seem to have extra blocks, do others do that, too? I hope all of you in the US have a wonderful Fourth, and take care with those fireworks! Normally we would be watching from the front yard as it has a good line of site to the show at the local Community Center. Home fireworks are banned throughout most of Southern California, as we are in our dry season and we don't need any fires. But this year we drove to Colorado to see our daughter and granddaughter, and saw the smoke pour from the Rocky Mountains just west of Colorado Springs in the worst fire in the state's history. Luckily, the weather has cooled a bit, and the highs are now in the 90's (from about 104), with a fair amount of cloud cover and occasional rainstorms. 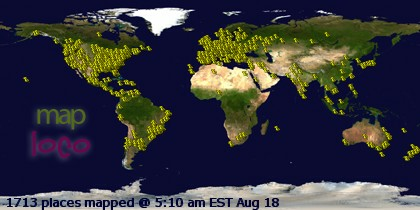 All of the fires are pretty much now under control, thank heavens.